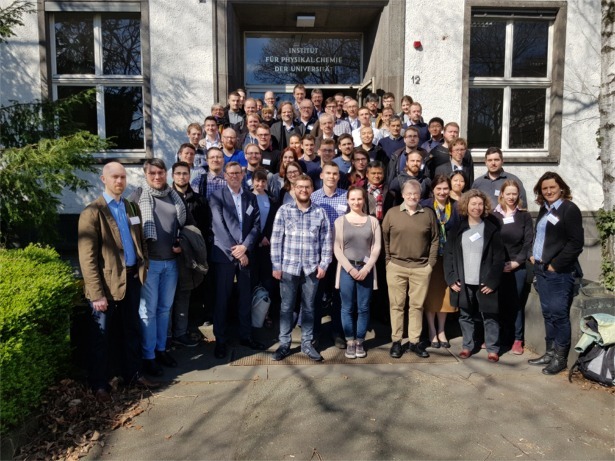 2nd SPP Meeting in Düsseldorf "Theoretical Methods for Modelling Electronically Excited States of Transition Metal Complexes" (organizer: Christel Marian). 29th International Conference on Photochemistry ICP in Boulder/Colorado, USA. 23rd International Symposium on Photochemistry and Photophysics of Coordination Compounds ISPPCC in Hong Kong. Photochemie-Tagung der Schweizerischen Chemischen Gesellschaft (SCG) in Fribourg (organizer: Oliver Wenger). 1st SPP Meeting in Bonn "Ultrafast Spectroscopy" (organizer: Peter Vöhringer). Kick-Off Meeting SPP 2102 LCRMC in Mainz (organizer: Katja Heinze). 43rd International Conference on Coordination Chemistry ICCC in Sendai, Japan. 27th PhotoIUPAC in Dublin, Ireland. Project Selection Colloquium PP 2102 in Mainz, Germany at Tagungszentrum Erbacher Hof. Central European Conference on Photochemistry CECP . in Bad Hofgastein, Austria. Deadline for project submission PP 2102. 1st International Symposium on Solar-Driven Chemistry SoLChem in Ulm, Germany. 22nd International Symposium on Photochemistry and Photophysics of Coordination Compounds ISPPCC in Oxford, UK. Meeting of the Steering Committee/Advisory Board in Mainz, Germany.